Incredibox is an easy to use but feature-full online music editor that enables everybody to create fun and catchy music with only dragging and dropping effects with your mouse! Create your own beatbox today! From the moment when you arrive at Incredibox you will be welcomed with the small tutorial and immediately moved to its innovative visual editor. By using your mouse, you can move Effects, Beats, Melodies, Chorus and Voice icons onto your singing avatar, making him sing. With only seconds of adapting to this visual style of music editing, everyone can become DJ and create catchy melodies that can be shared on the internet with a click of your mouse. 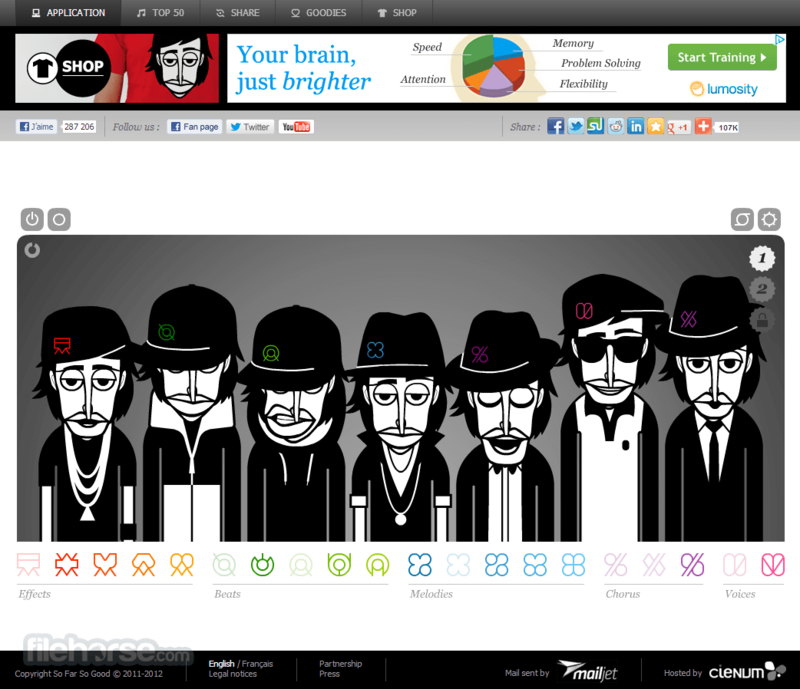 Showcase your hidden musical talent Incredibox, even if you never tried to make music before! Express your musicality with Incredibox! Music is all around us, but creating nice music that you would be proud to share with your friends and family is not an easy task. With no musical training, knowledge about how music is made and no tools to mix samples, no one can realistically expect to become music creator... but that is no longer true. Expansion of music-related web applications have enabled millions and millions of people from all around the world to play in sandbox environment, creating music that is engaging, fun and nice to listen. One of the best applications for extremely simple music creation is Incredibox – simple music editor that does not uses notes or complicated dashboards, but just simple array of musical samples that you can drag and drop and automatically create great music. Founded in 2009, this fun website which proud itself by very graphical-oriented visual design has went through several changes, always giving its users better visual tools for music creation. Create your own beatbox today! Effortless music creation is the core of the Icredibox’s service. It is so user friendly that you don’t even have to know anything about instruments, DJ dashboards, sample layers, or anything else. You only need to bring few moments of your time and the will to create something that will make you smile. Incredibox started its life in 2009, and ever since then it went through two redesigns that impacted the way you can create music. The latest version (V3) that was introduced in 2013 introduced the few new quirks into already fun and weird musical editor that looks like no other. Music creation process in Incredibox is easy, but it’sdefinitely a little twisted. When you start making music, you are welcomed with the figure of a man, and a list of 4 categories (Beats, Effects, Melodies and Voices)that contain headgear items (hats, glasses, headphones …). By simply moving those items on work area you will create more and more people, who will all sing new sound samples. With just seconds of practice, you will be able to get in a groove, creating ear-catching music that will surprise your friends and family. Finished song can be either shared to your friends, or downloaded to your PC. If this app does not give you a great insight how music creation can be fun and engaging nothing will. 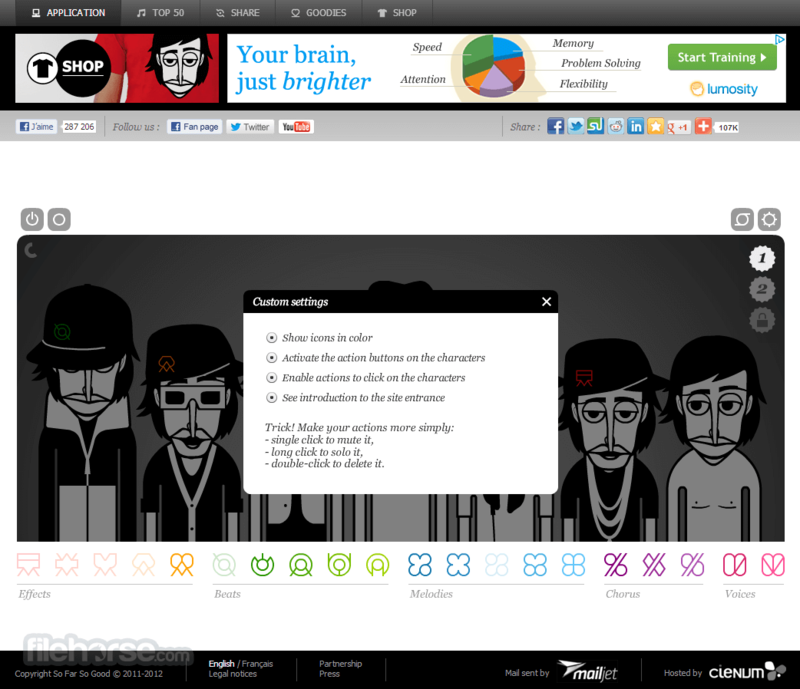 Incredibox can be accessed directly from your browser window, without the need for any plugins or add-ons. 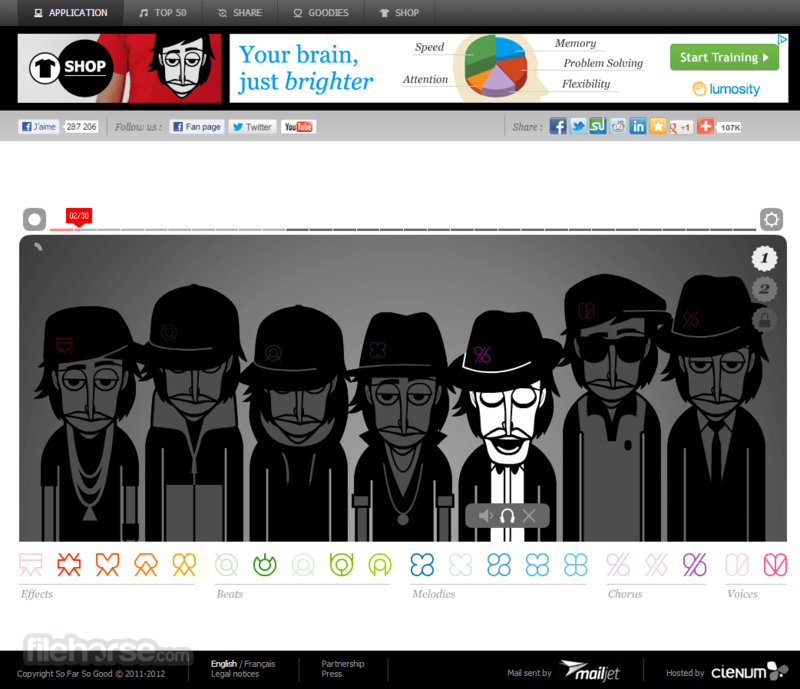 Interface of Incredibox is very different from many other music editors that you can find online. On its mainapge you can select one of the 3 versinos of editor that were introduced over the last 5 years of the site’s existence. Each of those editors works on the same principle of drag and drop, but they offer different samples that you can mix and match without any limits. Incredibox is 100% free, without any payments that unlock site features of new musical tools. The only things that you can buy on site are various T-shirts with logos taken from its musical editor. Incredibox is a very relaxing musical tool for compelte novices, who will find out that with only few seconds of practice they can create fun music that can be shared over entire internet. Create your own beatbox today!